At the end of March, I will be leaving my position at the National Endowment for the Humanities (NEH) to become the director of the Digital Culture program at the Social Science Research Council (SSRC). I’m tremendously excited about the work being done at SSRC, which has a long and venerable history and a strong commitment to fostering scholarship that is both historically informed and relevant to current social and political discourse. I’m very happy to know that much of the work I’ve pursued at NEH–fostering digital scholarship, encouraging collaboration, and advancing scholarly communication–will remain priorities for me in my new role at SSRC. Even as I look toward future endeavors, I feel particularly indebted to my colleagues, both past and present, in the Office of Digital Humanities (ODH), which is nearing its 10-year anniversary. Brett Bobley, Perry Collins, Ann Sneesby-Koch, and Michael Hall have all taught me much about digital humanities, collegiality, and yes, effective bureaucracy. And Jennifer Serventi remains to me a shining example of the best our government has to offer. She’s one of the smartest people I know, one of the most humble, and one of the most generous. She was also the first to reach out to me when I arrived and taught me much of what I know about NEH and how it functions; I will be forever grateful for this early kindness, for her friendship, and for her unmatched institutional memory. We all built ODH together, and I’ll miss our daily interactions. There are so many others I’ve worked with and alongside over the years that I wish I could thank individually, and hope to have the occasion to do so in my remaining time there. It has been a tremendous privilege to spend nearly 13 years at NEH, not only because I’ve been daily surrounded by wonderful colleagues and friends, but also because I’ve been lucky enough to support the work of scholars stretching across humanities disciplines and interests. I’m very proud of what we accomplish with limited resources, and truly believe that NEH reflects the best of the federal government in its commitment to service and its clarity of mission. 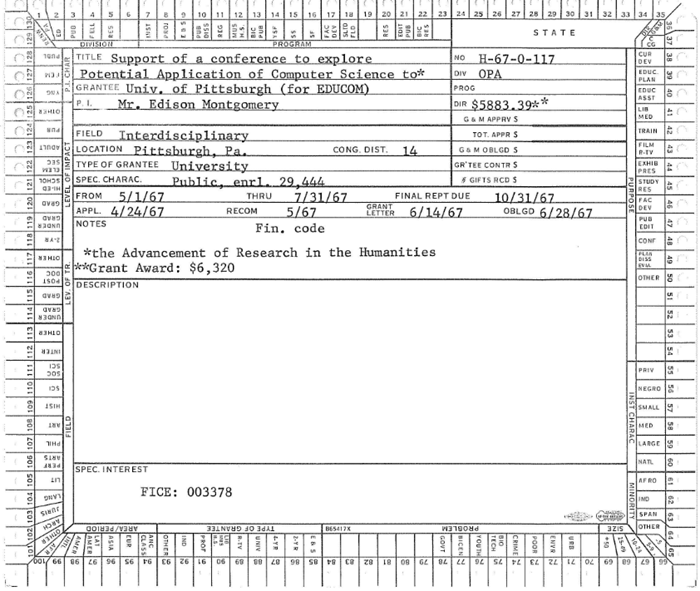 Ann’s work on the McBee cards, and Perry Collins’s work building NEH’s institutional repository, did much to uncover the deep history behind a truth long known–that work across the intersections of technology, computing, and the humanities happens across multiple divisions of NEH (just as, analogously, it has across the disciplines that NEH serves), and has done so for quite some time. 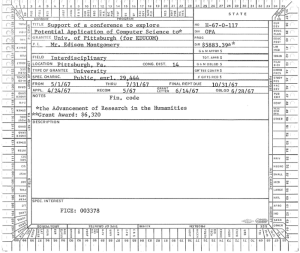 Whether digitizing the public record (Preservation & Access), developing teaching resources (Education), fostering digital public history (Public Programs), or developing critical scholarly editions (Research), NEH has been at the forefront of digital humanities, before it was even called digital humanities. It’s perhaps not surprising that at this moment of personal transition, before the 10th anniversary of ODH, and during the 50th anniversary of NEH’s foundation that I might reflect on our history a bit (and thanks, for those still reading, for your indulgence). Anyone who has sat through a grant workshop with an ODH staff member knows that we often point to Our Cultural Commonwealth: The report of the American Council of Learned Societies Commission on Cyberinfrastructure for the Humanities and Social Sciences (also about to celebrate its tenth anniversary) as one of the most influential in our development and thinking. Its recommendations to fund more basic research and tool development, to build human infrastructure through training opportunities, and to foster collaboration both domestically and internationally became the basis for many of the grant programs still offered today. Under the leadership of Jennifer Serventi, grants have been made through the Institutes for Advanced Topics in the Digital Humanities that have trained more than 500 scholars, librarians, graduate students, archivists and others in advanced techniques for digital scholarship. Many of those scholars–in addition to taking leadership roles in the field–have gone on to offer repeating courses at recurring training series like DHSI and HILT, expanding the impact of NEH’s initial investment. Still others have used those Institutes to generate testbeds for software development, resulting in advancing the development of platforms like USC’s Scalar. I’m very proud to see–through grants offered through programs like Start-Up and Implementation Grants, as well as Institutes–the growth of a digital humanities that is more inclusive in terms of race, gender, and ethnicity, while acknowledging that this advancement is reflective of necessary, ongoing efforts that will never be completed. ODH-funded projects like Mukurtu & Scalar, often highlighted by scholars as exemplars of attentive feminist, post-colonial critique in-and-through design, found some of their earliest support through our programs, and have since scaled–through additional ODH support–to serve as broad platforms for diverse scholarship. I’m likewise proud of the myriad ODH-funded projects that expand our understanding of the histories of race, ethnicity, and gender. Any careful, thoughtful exploration of the topics underpinning ODH grants can see this growth; the quality of that work and its impact on our understanding of topics like emancipation and slavery, women’s history, African American studies, and indigenous cultural history (to name but a few) demonstrate why there’s so much more valuable work to be done. Increased diversity is not only reflected in grant-making (over which we have only partial control), but importantly in the make-up of our panels (over which we have much more control). The act of inclusion is an act never completed, an act never perfected, and an act always in need of care; I’m glad to know that such progress continues through these programs, and I encourage an increasingly diverse audience to submit applications. Research on, about, and using games and game technologies (and other born-digital cultural objects) has increased significantly since I first circulated an internal memo on the topic of ‘games and the humanities’ over a dozen years ago. While the mention of games once (I think it’s fair to say) generally led to a raised eyebrow, we now see grant programs in multiple NEH divisions that engage with game development or technologies on a fairly regular basis, from experimental game design, to cultural heritage preservation strategies, to the study of game culture and harassment–all of which demonstrate the deep relevance of humanistic inquiry to contemporary needs and interests. Fostering opportunities for and broader understanding of a broader landscape of career options for humanities scholars and students — sometimes labeled “altac” — has been a particular concern of mine for some time. I’m pleased to see increased attention to these issues and, importantly, a significantly changed culture since I first “left” academia for the NEH, not then imagining my role as a larger one within an alternative academic ecosystem, where non-tenure-track had already become the norm. Academic cultural expectations continue to shift, but it’s striking how much they have shifted in the past decade. The development of international collaborations was a key recommendation a decade ago, and setting up an international grant program with JISC in the UK, and then DFG in Germany, was my first assignment as a newly appointed program officer in what was then just the “Digital Humanities Initiative.” We emphasized international collaboration in part because diversity of knowledge requires a humanities that spans borders, and in part because a technical infrastructure requires joint effort. Those international relationships have since blossomed from a few European countries to multinational efforts such as the “Digging into Data Challenge.” Through the leadership of Brett Bobley and Jennifer Serventi, the Digging into Data Challenge now involves “a consortium of sixteen international funders of social sciences and humanities research from Europe, South America, and North America” under the auspices of the Trans-Atlantic Platform. Sixteen! From eleven nations, including new partners Argentina, Brazil, Finland, France, Germany, Mexico, and Portugal. As you may have noticed, I’m enormously proud of my colleagues and their accomplishments (and here I’ve listed only a few highlights), and I appreciate your patience as I take this chance to celebrate the past decade of work, even as we all look forward to coming opportunities. At some point in the very near future, I won’t be directly prohibited from advocating for more money to support the kind of work described above, which I’ve overheard described as “woefully underfunded;” I encourage you take a moment to think of what my future self might say at this moment even as I, presently, adhere to the strict non-advocacy rules that bind federal employees. Humanities scholarship is important to the health of the nation, and–factually speaking–is a fraction of what it was under Nixon, adjusted for inflation. Under. Nixon. I’ll leave that here for my future self to discuss. In addition to celebrating my colleagues and our collective endeavors, I’d like to thank the thousands of scholars, librarians, scientists, and students who have shared your work with me. Your ideas have inspired me, and I’ve enjoyed working with you all over the past thirteen years. I hope to continue to do so in the future. Bravo, for a job well done. You’ve been a model of efficacy and careful restraint through the years I’ve watched you. You’ve been a careful steward of resources, one of the most critical of which has been hot and your colleague’s time evaluating the work of others. Omigosh, Jason. I leave Twitter for two days, and this is what I miss!! 😉 Congratulations on the new job! I am a little sad for the network of DH scholars who will be losing you as their connecting point through NEH, but I know you will be connecting that many more through SSRC. Your work at NEH has been invaluable to so many of us. Thank you for your many years of service and good luck in your next role! Congratulations, Jason! Sorry to learn that you’ll be lost to NEH, but so glad your talents and personal qualities are being recognized, that your contributions to digital humanities will continue, and that you’ll be able to live full-time with your family. Godspeed!